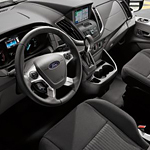 The Innovative Technology Features of the Ford Transit Passenger Wagon | Rhinebeck Ford Inc. The Lane-Keeping Alert with Driver Alert System is also included with the Transit. The Lane-Keeping Alert relies on a camera that is mounted in the windshield to scan for lane markings. When it detects that the driver is unintentionally drifting, it will send an alert through a series of vibrations on the steering wheel. The Driver Alert System will issue visual and audible alerts to drivers if it detects that lane drift is occurring because the driver is tired.